Don't be the guy who says, "That could have been my picture." Sports Cards Plus, a.k.a. The Super Hit Factory, the home of The BEST CASES in The Hobby, will be providing our customers with the most amazing hits this week. Chris and his wife drove 140 miles from Corpus Christi, Texas for some great Panini products with FREE 2014 Black Friday Packs. Chris tried a box of 2014 Panini Crown Royale Football ($89.99 per box) and pulled this Johnny Manziel Autographed Silhouette Jersey Patch #d/49. And, The Legend of The Super Hit Factory continues. Be like Chris. Go to Sports Cards Plus TODAY and continue The Legend. We still have about 500 Panini Black Friday Packs for our customers. You saw Brad's Johnny Manziel Black Friday Cracked Ice Autographed Jersey Patch Auto #d/5. You know we still have more great Black Friday Super Hits waiting for you. Get from 1 to 10 FREE Panini Black Friday Packs with ANY Panini Box Purchase over $50. That's right! Even the new 2014-15 Panini Prizm Basketball ($75 per box) will get you a FREE Black Friday Pack! Due in Thursday is 2014-15 Panini Prizm Basketball for ONLY $75 per box. Each Hobby box gets you one autographed RC, 14 Prizm Parallels including three numbered, two short prints and 2 inserts. JUMBO Hobby Boxes get you THREE Autographs, 22 Prizm Parallels including 4 numbered, four short prints and four inserts. 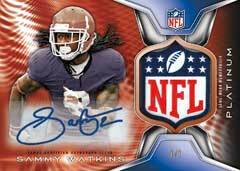 2014 Topps Platinum Football is due in WEDNESDAY at Sports Cards Plus. As always, we are passing on the Super Hit Factory MOJO to our customers. 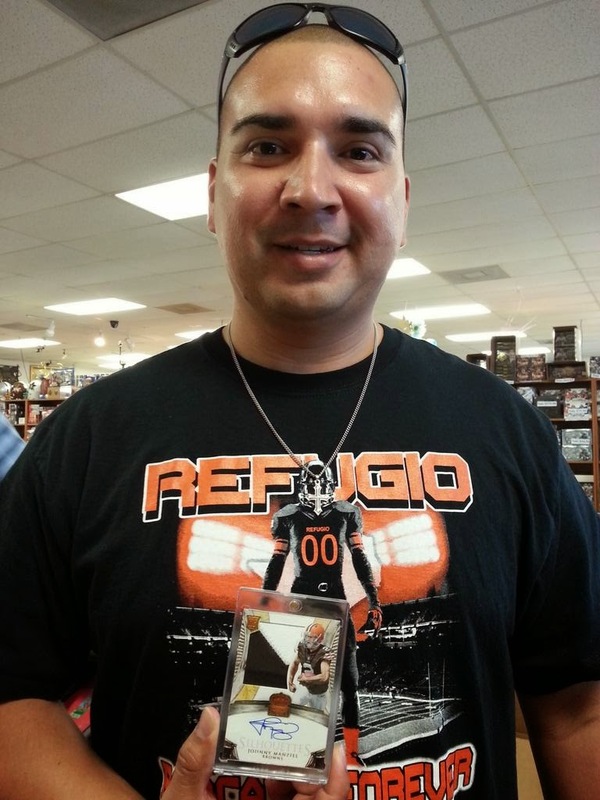 In 2012, Chris pulled the Andrew Luck Auto Patch SUPERFRACTOR RC 1/1. What will you pull? Every box of 2014 Topps Platinum Football (Only $89.99) gets you Three Autographs including ONE Autographed Refractor Jersey Patch. Also due in Wednesday at The Super Hit Factory is 2014 Topps High Tek Baseball for ONLY $62.99 per box at The Super Hit Factory. Bringing back the nostalgia of the best from the 90's, 2014 Topps High Tek Baseball delivers 1 Autograph per box along with six base cards and one parallel numbered to 99 or less. 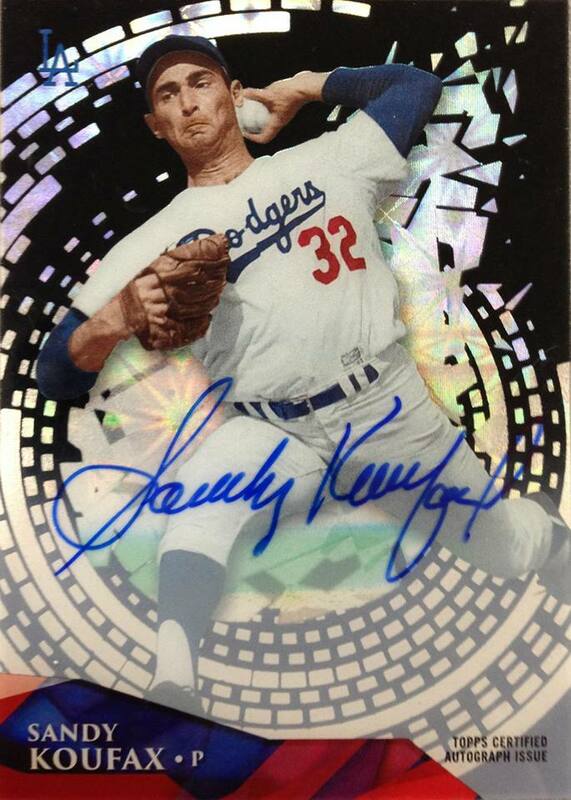 There are 12 packs per case with each case delivering a buyback autograph or a "re-created design Diffactor." And then there is 2014 Topps Dynasty Baseball due in Wednesday. Topps Dynasty is not for the faint of heart. With one Super Premium Autographed Card per box ($319.99 at the Super Hit Factory), these boxes are a little risky but the possibilities are amazing. Every card is numbered to 10 or less and the checklist only includes the top rookies, current super-stars and cut autographs of the greatest baseball players of all-time. Cut autographs include Babe Ruth, Lou Gehrig, Ty Cobb, Honus Wagner, Roberto Clemente, Jimmy Foxx, and just about everyone who is important to baseball history. Look for rare dual autograph cuts. So go to Sports Cards Plus, a.k.a. The Super Hit Factory TODAY. Pick your box from The BEST CASES in the Hobby and become a part of Sports Collecting History.